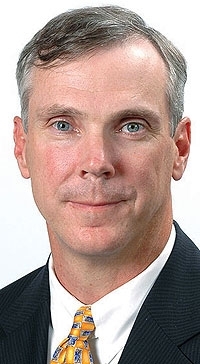 DETROIT -- Mark McNabb, who was hired by GM 13 months ago to lead Cadillac, Saab and Hummer and ended up trying to sell two of the brands, has resigned. McNabb, 48, will leave on June 1 to pursue other job opportunities, Cadillac spokesman Klaus-Peter Martin said. In the interim, Stephen J. Hill will serve as Cadillacs chief. Hill, 48, has been the general sales manager of GMs premium channel since 2008. Hell continue in that position while taking on McNabbs responsibilities. The channel is comprised of Hummer, Cadillac and Saab. Two months after McNabb was hired, GM put Hummer up for sale as gasoline prices soared. Saab was put on the market late last year as GMs financial condition worsened. McNabb joined GM after resigning as senior vice president of sales and marketing at Nissan North America Inc. He had spent the first 20 years of his career at the Nissan and Infiniti divisions. In late 2005, he left to become head of marketing at Mercedes-Benz USA. He became vice president of Mercedes sales before returning to Nissan in June 2007. When McNabb joined GM, Cadillac was led by Jim Taylor.In October, he was named CEO of Hummer. If GM sells Hummer, GM has said Taylor would have to decide then whether or not to leave GM. Taylor, 52, was instrumental in Cadillacs product renaissance over the four years he headed the division. Cadillac will launch two new vehicles this summer: the 2010 SRX crossover and the 2010 CTS sport wagon.